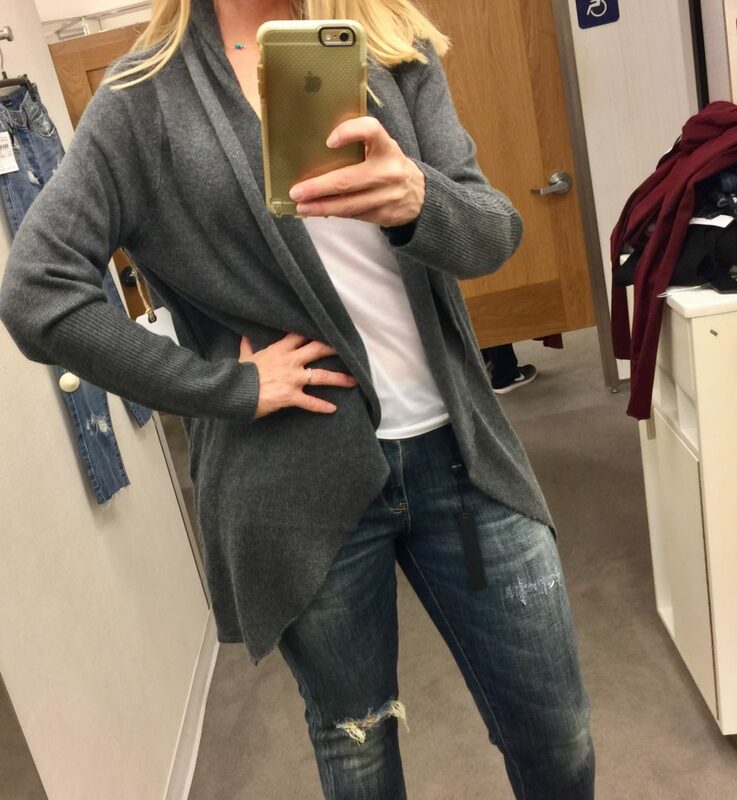 Nordstrom Anniversary Sale – Dressing Room Selfies Part 1! 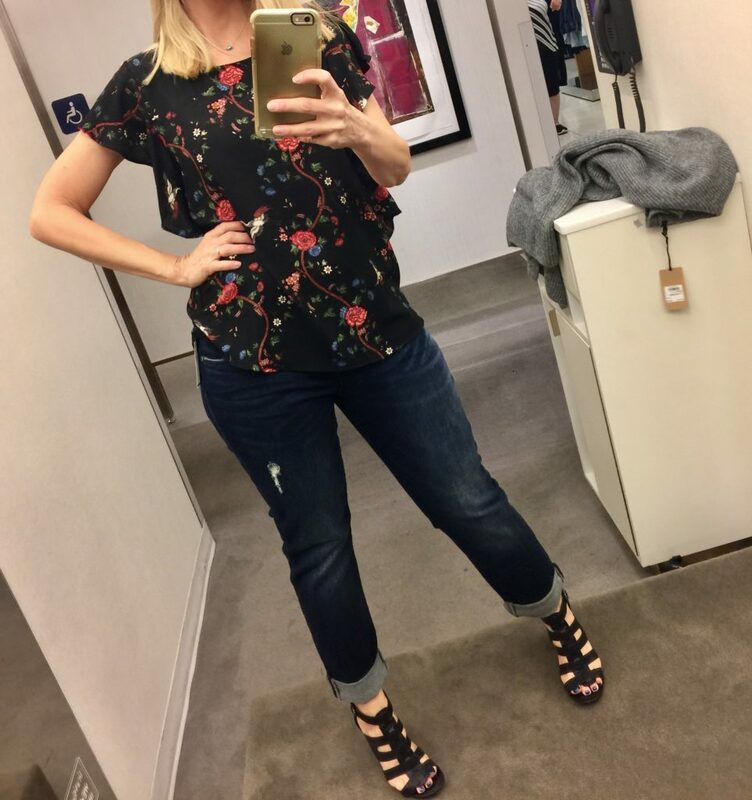 Okay Ladies, here it is … my Nordstrom Anniversary Sale dressing room round up!! 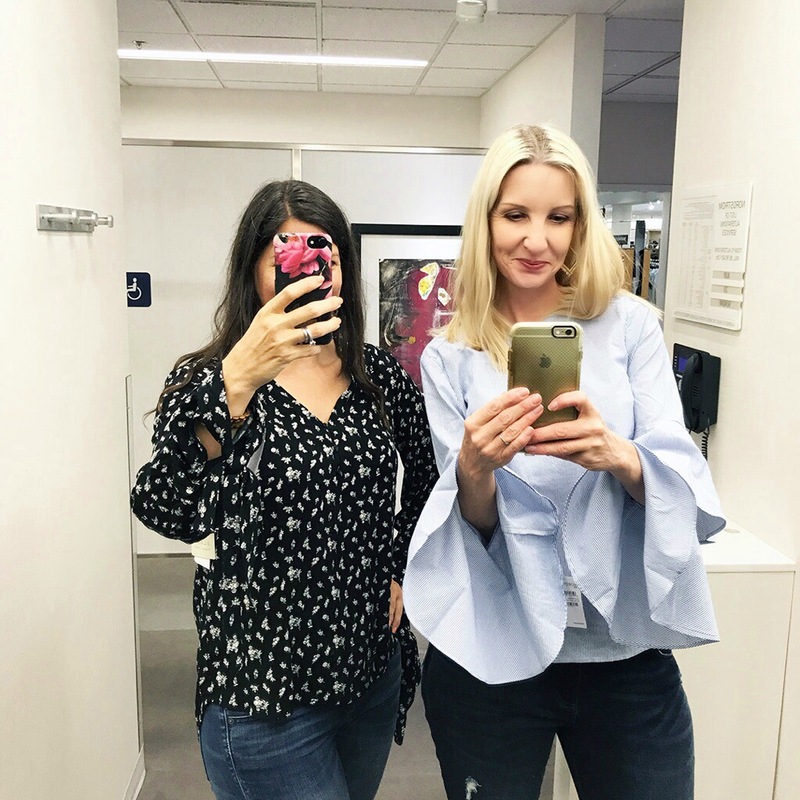 When bloggers hit the dressing rooms … look out!! 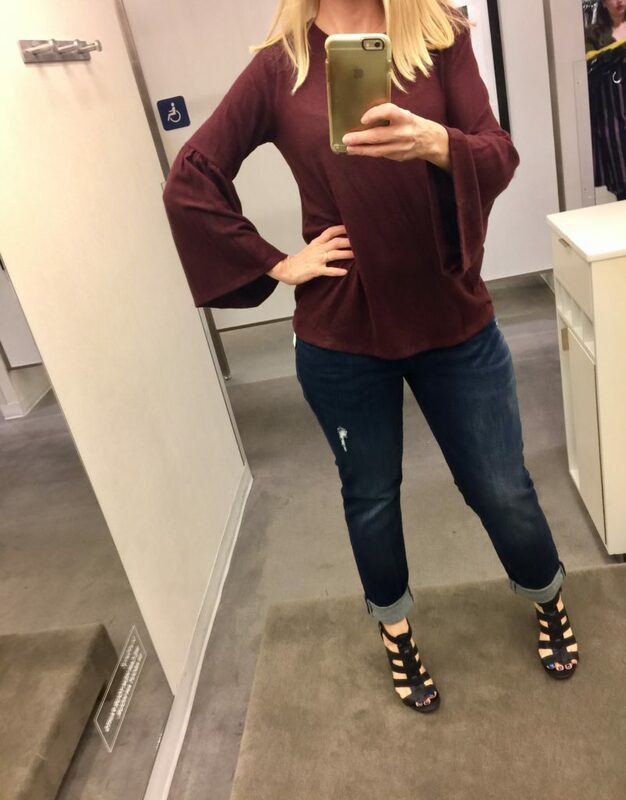 In this shot, Cathy of Bay Area Fashionista has on the Hinge tie sleeve blouse, … so cute and comes in four patterns/colors. I’m wearing the Chelsea 28 Bell Sleeve Poplin top. Both tops are super cute, on trend, and true to size! So this Halogen sweatshirt with the laces on the sleeves was totally cute and comes in more colors too. (Side note: can’t find link. Maybe it’s sold out? I’ll add in link when it comes back in stock). 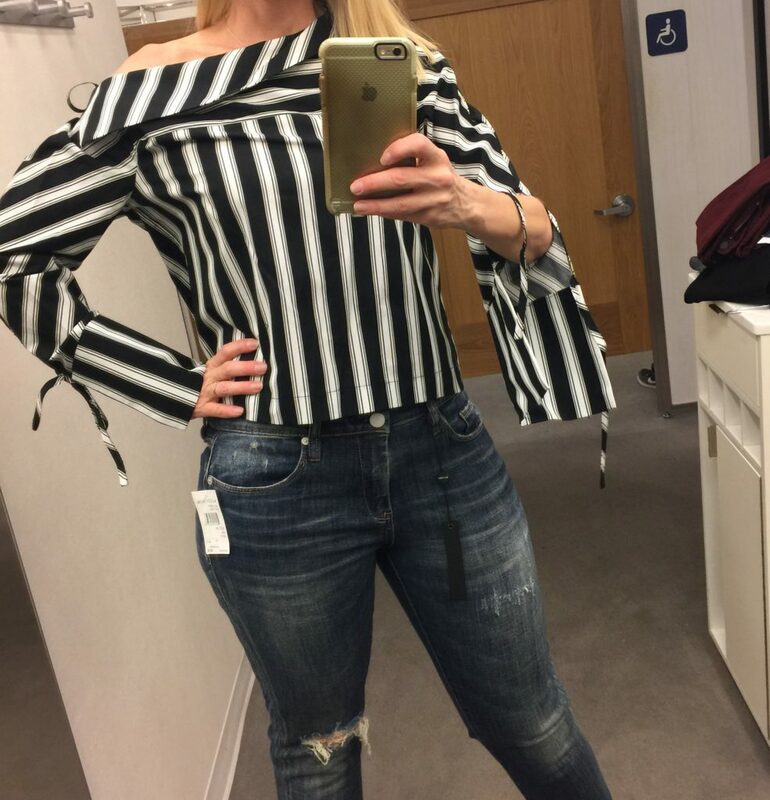 If you’re between sizes, size down, this is an XS! I’m about a 2/4 on top. 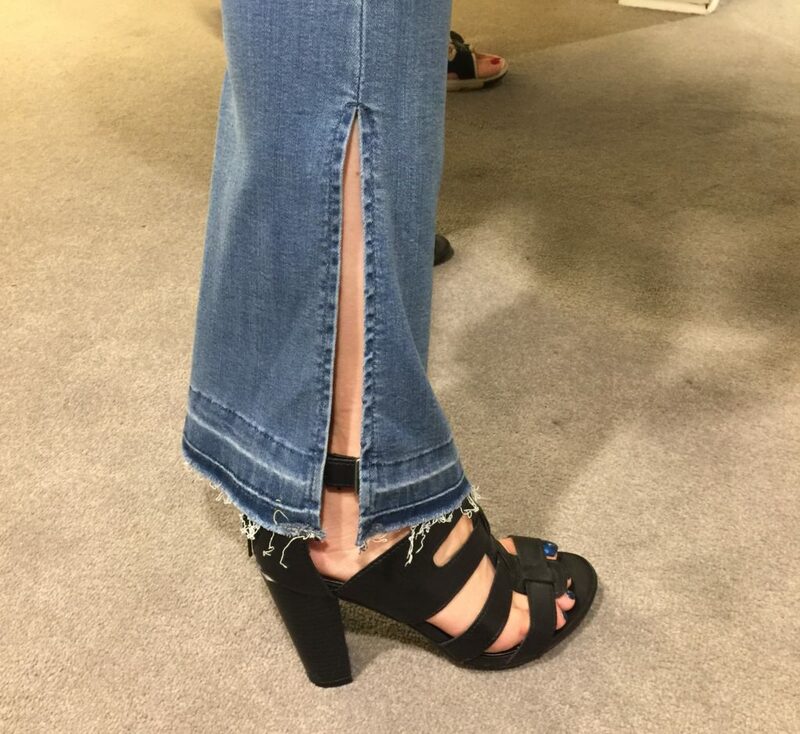 Also, loving these KUT Catherine BF jeans! Perfect fall basic, comfortable and true to size (I’m wearing a 6). Well, I think my face says it all. I’m sure this little Chelsea 28 t-shirt with tulle sticking out the side will be adorable on somebody. But not me! Bell Sleeve cozy fleece pullover is cute and comes in lots of fab colors. But I’m wearing an XS and it’s huge, so size down! Wear this pretty floral blouse from Bobeau now and in the fall! Three colors. True to size! Love this cute Pleione tie sleeve sweatshirt! Comes in six pretty colors! 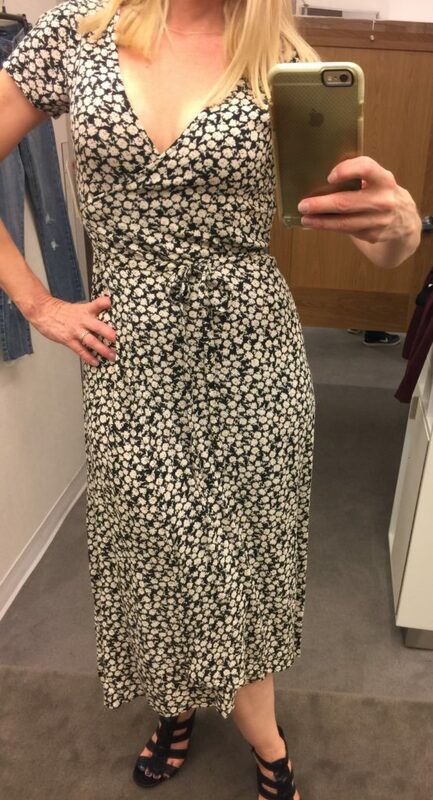 I bought it in the “Red Chili.” Runs big, size down (I’m wearing the Petite XS here!)!. Also remember to tie the sleeves before you put it on. LOL. And these are some great flattering basic jeans, Barbara Stretch bootcut NYDJ, dark wash (Sinclair). I’m wearing a 4 (always size down one size for NYDJ). Loving this pretty Kenneth Cole coat. Comes in grey too, but isn’t this nutmeg shade just scrumptious! True to size. 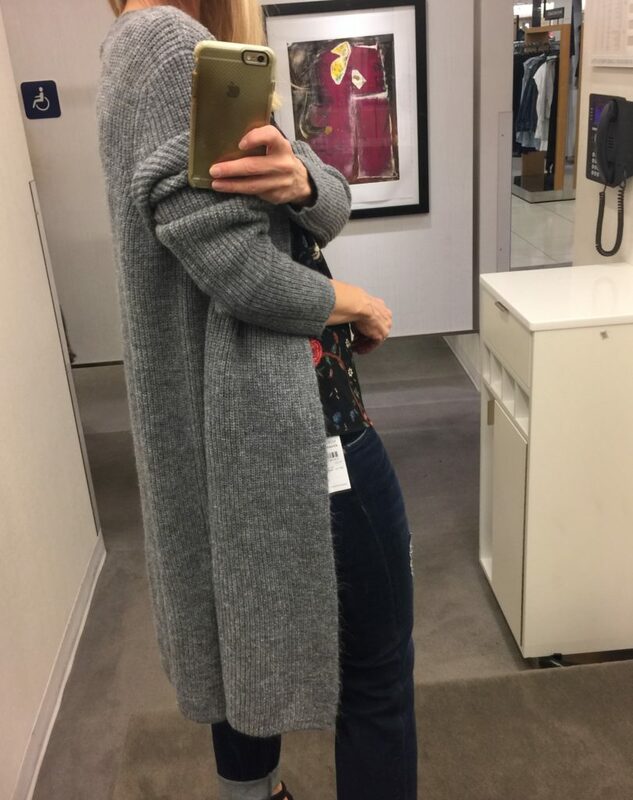 I was keeping an eye out for a long gray cardigan and ended up with this one from Halogen. Loved the texture and the length. This cozy Leith cardi was a close second. This Topshop Spliced Poplin shirt is very cute, but the length is pretty cropped on my 5’7″ frame. 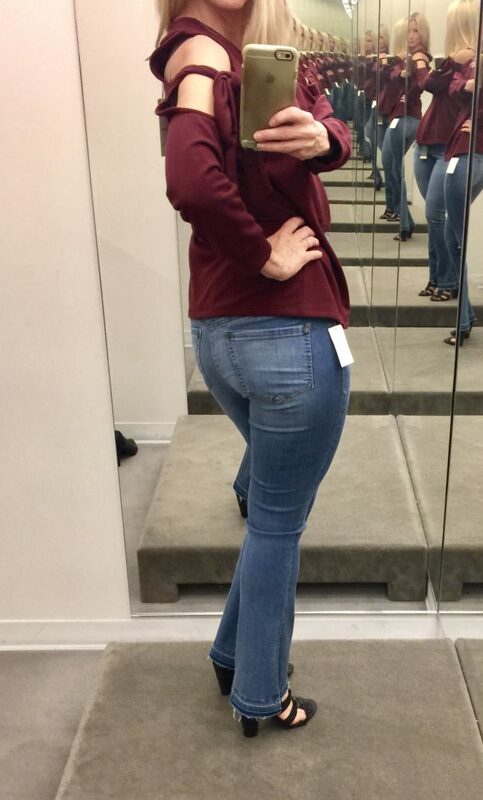 And loving the Hayden busted knee BF jeans, also a Topshop find. 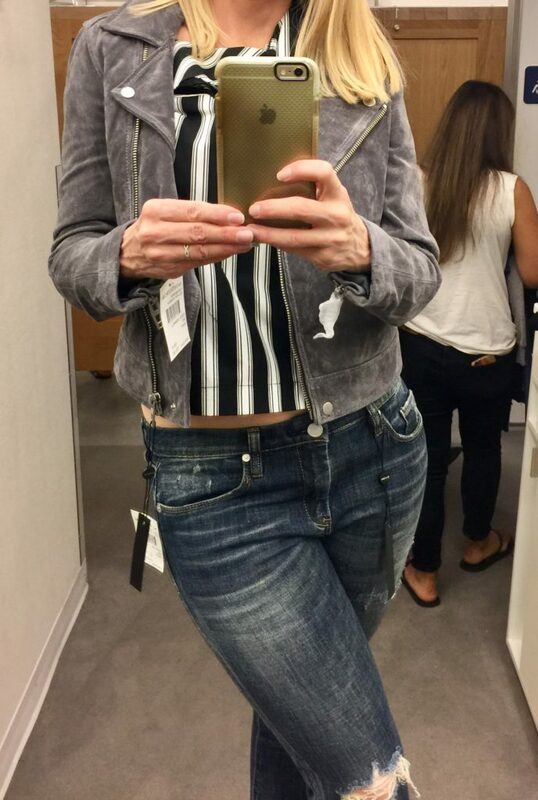 Such a cute gray suede jacket from Blank NYC! Three fab colors! I might have to come back for this! This is an XS, but I’d probably get a S to wear over sweaters. Another fabulous Blank NYC Moto!! Had such a blast trying on clothes with Cathy of Bay Area Fashionista and Laura of Have Need Want! 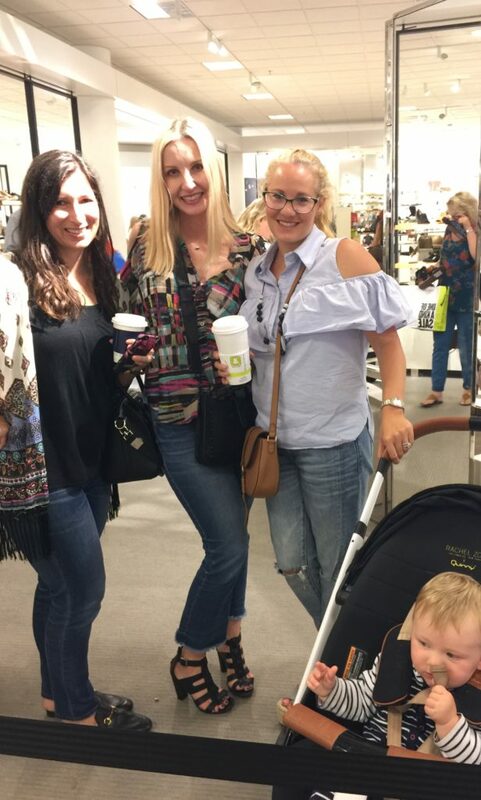 Lots more Nordstrom Anniversary Sale coverage to come. A closer look at everything I ended up buying in my next post! Did you see my list of picks? Remember this is early access for Nordstrom card holders and everyone can shop starting 7/21! Did you get anything yet? Let me know in the comments! 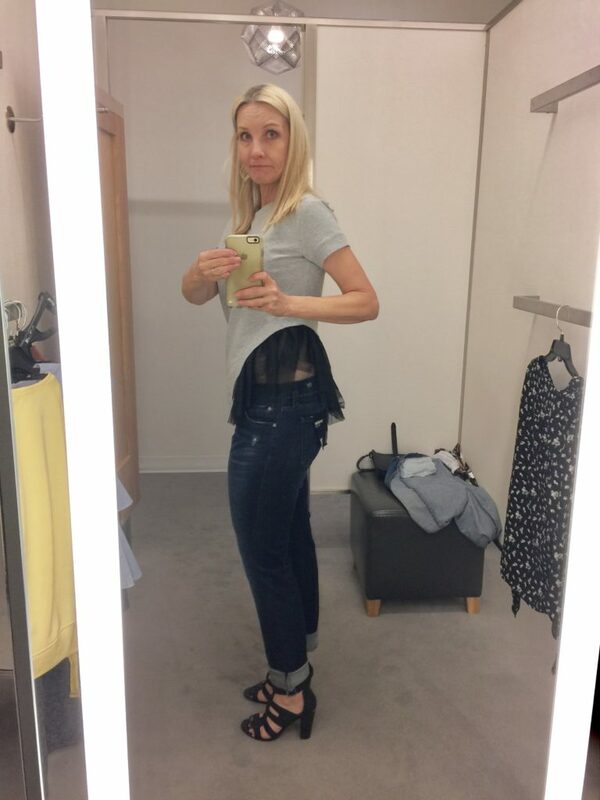 Edited to add: Part 2 of the Nordstrom Anniversary Sale Dressing Room Diaries is now available! I really love how you showed different clothes in reality. It seems more real and gives me an idea of what I would like if I got them. The wrap dress and the leather jacket are my favorites. I am organizing a link up. Feel free to join and share your latest post. So much fun!! You tried on so many things! I love that burgundy cold shoulder sweatshirt on you, so cute!! The striped Topshop blouse looks so cute on you too! Wow! So many great items! But the last moto really stands out for me! It was great to FINALLY meet you! I’m so glad you tried on that burgundy cold shoulder sweatshirt! I love it and decided to get it in the burgundy over the grey that I tried on. Super cute picks ladies! 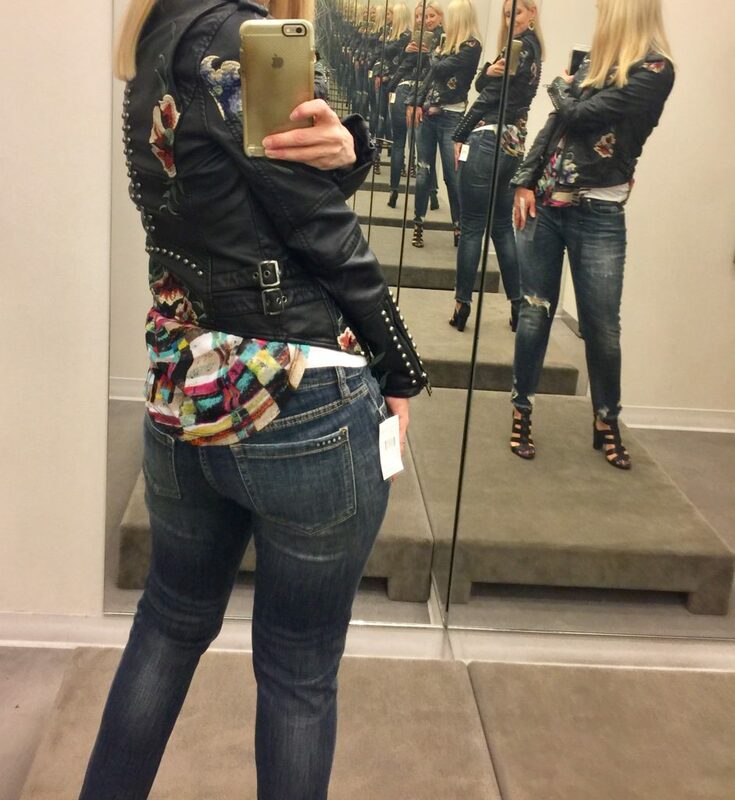 And how about those control top jeans? Brilliant!